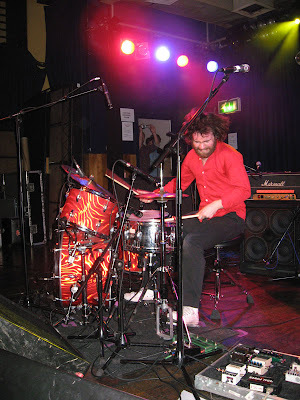 Concert Review: Liam Finn @ Scala 02/12/08 and how I was squashed and fed into a loop pedal! 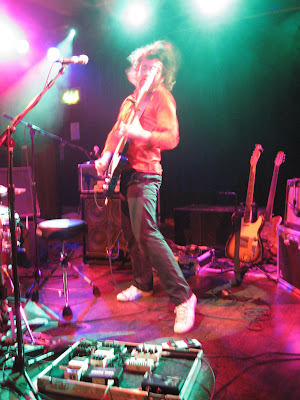 Yesterday evening I got squashed and fed into a loop pedal. Wondering what I did? I stood in the audience at a Liam Finn concert. Having easily managed to secure a spot directly in front of the stage (so I could take fuzzy photos to share with you) me and mine stood patiently chatting and waiting for the support acts to show and we were so unprepared for what came next. Even though the room was still pretty empty, one lady annoyingly decided to lean into us; it was so unnecessary and a prime example of really bad gig etiquette. Shoot me down for saying this but a lot of my bad experiences at gigs have been as a result of girls trying to aggressively push their way to the front – here’s an idea: if you really want to be at the front, get there earlier! (grrrrr… there, rant over :-p). The room eventually filled up and the first of two support acts, Connan Mockasin, wandered onto the stage. His voice was a little high pitched for my liking but his show was quite a spectacle involving lots of black tape, toilet paper and a beach ball! Lots of fun! Lawrence Arabia played next. Their tunes were OK but as the sound of chatter coming from the audience highlighted, people were here to see Liam Finn and I felt that maybe they played a few songs too many, it must be hard to be the second act. When they had finished the drum kit was moved to the front of the stage along with a tray of electronic switches that would make any Maplins enthusiast salivate. Liam made a brief appearance on the stage to record some drum loops and then retreated backstage for a few moments before reappearing with his other band member backup vocalist and multi-instrumentalist Eliza-Jane. This was the final week of a tour that has taken them across the states, promoting the album I’ll Be Lightning, which has made it into Q magazine’s top 50 albums of the year. Kicking off the set with “Better To Be” Liam might have left a few audience members wondering how there were drums in the song when there was no one sitting at the drum kit? And how did his guitar go on playing after he had put it down? Remember that tray of electronic switches I was telling you about earlier? Well some of the switches are loop pedals and in effect (along with Eliza-Jane) are his band (sorry if you already knew that!). 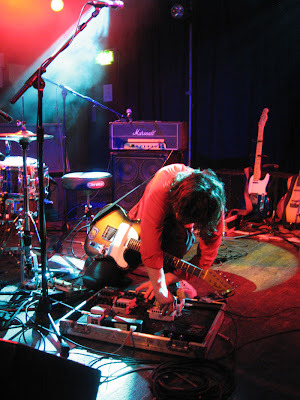 Loop pedals enable a musician to record music being played at any moment of their set and play it back at the press of a pedal at any point they want. It was impressive to watch the pace at which he recorded and controlled all the different sounds during the songs; the guy is a multi-tasker extraordinaire! Liam Finn - multi-tasker extraordinaire! Much to Liam and Eliza-Jane's pleasure, the audience sang along with many of the songs, and later on during the set Liam turned the microphone towards us all and recorded our fairly reasonable attempts at singing (?) 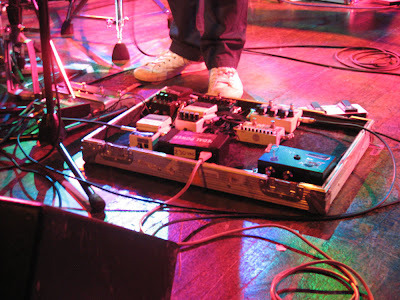 into a loop pedal to be used as part of the song. Even though I don’t think it actually sounded that good in the song, I thought this was a nice touch. My favourite song of the evening and an instant crowd pleaser was “Second Chance”. Towards the end of the song Liam performed an intense drum solo that he finished by pretty much ejecting himself backwards off his chair in a way that would make you think he'd suddenly burnt his bum. It was a good example of the kind of energy he injects into his performances. Watch this video I found on Flickr from last night to see what I mean. Towards the end of the set, something small hit me under my right eye causing a short sharp jab of pain. 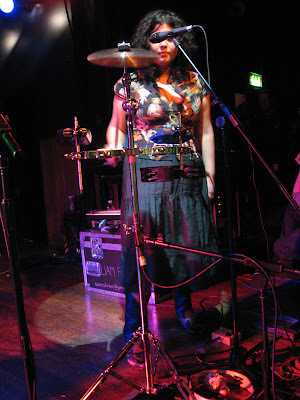 I thought it might have been a splinter off Eliza-Jane’s drumsticks because she was standing mighty close but then, at the same time, something went wrong with Liam’s mass of electronic pedals, they seemed to loose power making me wonder whether I’d actually been hit by an electronic spark. As I mentioned earlier, I was standing right in front of the stage, there’s no press pit at Scala. I do have a bit of a history of giving electric shocks to people, so beware crowd pushers – it might actually be dangerous to stand next to me! An un-phased Liam fiddled with lots of wires, quickly resolving the situation and then brought on all the members of the support bands to accompany him and Eliza-Jane for the next song. Leaving the stage on a high after a superb rendition of “Lead Balloon” I felt for sure that would be their last song so I was a little surprised when they returned for an encore. Unfortunately about two songs in we had to leave to catch a train missing the end of the gig. Overall I did really enjoy the evening, the energy and passion with which Liam throws himself into his music was a joy to experience but I did feel that some of that momentum was lost during the encore and maybe they should have finished at “Lead Balloon”. I must also mention it was nice to bump into music blogger Crazy Bobbles who has some fantastic photos. Sounds like a great show! I have to agree with you about people who show up late and try and push to the front, they drive me mad! And also about people that decide they want to lean on you- what's that all about? I don't get why they do it. The looping sounds cool, and I love sing a longs but most of the shows I go to people don't sing, or it's too quiet to sing. Great shots - must have been fun!